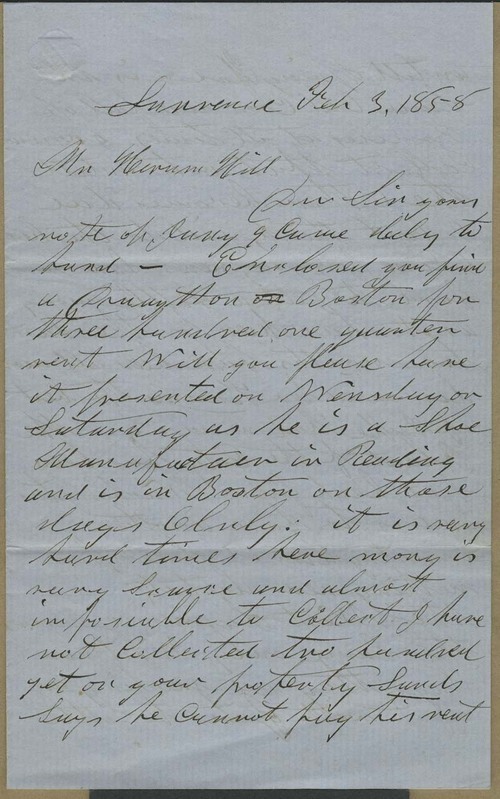 Henry Parker wrote from Lawrence, Kansas Territory, to Hiram Hill in Massachusetts. Parker reported that money had been scarce that season, that the float of West Lawrence was still being investigated by Washington, and discussed town lot values related to the "float" status of the land. Parker also updated Hill on recent political events; the Legislature had convened and was discussing moving the territorial capital. More significantly, a box of votes from the recent Lecompton Constitution election had been discovered under a woodpile, and the Legislature was busy making "stringent" laws to curb future acts of election fraud.